Canada's National Day  July 1, 2010  was marked by high-profile activities in Ottawa and London. In the Canadian capital, Queen Elizabeth was photographed wearing a diamond maple leaf broach, as she and Prince Philip attended July 1 festivities. In London, Trafalgar Square was annexed by Canada for a day-long program of Canadian music, sport, art, culture, food and drink. Foreign tourists joined Canadian nationals in watching hockey exhibitions, sampling poutine  a cholesterol-laden, heart-stopping dish of french fried potatoes, gravy and cheese  and enjoying Canadian musicians perform under the hazy London sunshine. Displaying pride in their country's reputation and achievements, Canadian citizens waved their national flag, showed off maple leaf tattoos, held up red balloons with the motto: Fall in love with Canada, and wore Canadian-logoed tee shirts. The beneficiaires of Canada's largesse on July 1 were, by in large, blissfully unaware of a demonstration taking place within spitting distance of Trafalgar Square. 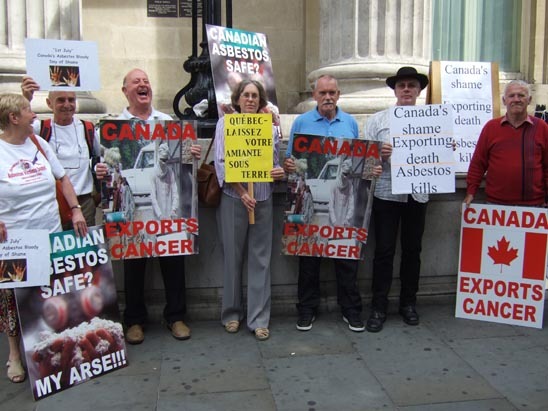 Just a couple of meters across the road from the celebrations, scores of British asbestos victims, campaigners and trade unionists, took part in a protest outside the Canadian High Commission against Canada's export of chrysotile asbestos. 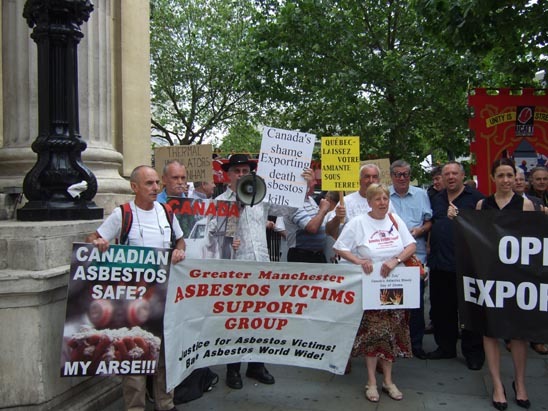 The demonstration had been organized jointly by the International Ban Asbestos Secretariat and UK trade unions such as the GMB, the NUT, UCATT, Unite and ATL and was supported by a coalition of civil society groups such as the Forum of Asbestos Victims' Support Groups and the London Hazards Centre. 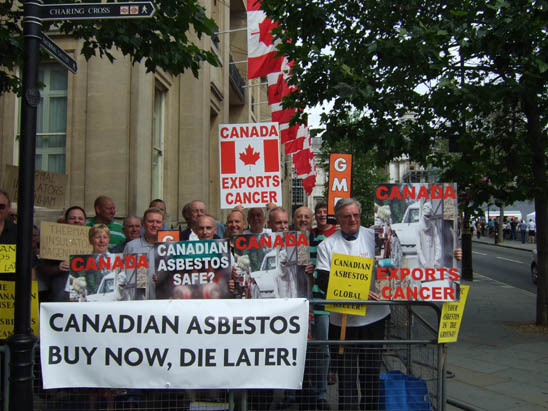 Canadian Asbestos  Buy Now, Die Later! 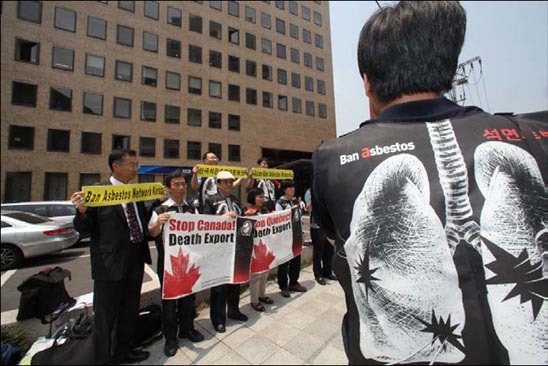 This protest took place against an upheaval of opposition at home and abroad against plans by the Quebec government to loan $58 million to fund development work at the Jeffrey Mine's new underground asbestos operations. On June 24, Quebec's National Day, demonstrations against this outrageous use of public money were held in South Korea, Japan, the Philipines, Indonesia, Hong Kong, India, Belgium, Brazil and the U.S. In front of Quebec trade office in Seoul.